The Coopered Tot: Rock Hill Farms - high rye mashbill hits the perfect balance of elegance and fierce heat. 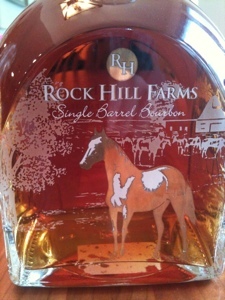 Rock Hill Farms - high rye mashbill hits the perfect balance of elegance and fierce heat. 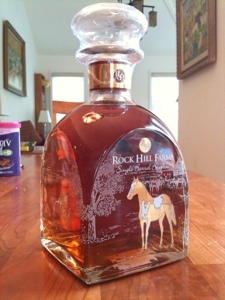 Today I'm drinking Rock Hill Farms - a single barrel bourbon bottled at 50% abv, by the fine people at Buffalo Trace. Rock Hill Farms sports no age statement, and enjoys, apparently, the high rye "mashbill #2"used in such Buffalo Trace bourbons as Hancock President's Reserve, Blantons, Elmer T Lee, Ancient Age, and Virginia Gentleman. I say "apparently" because there is very little information about this brand on the Internet. On the topic of "mashbill #2", Jason Pyle's Sour Mash Manifesto says so. So does StraightBourbon.com. However there's no primary source that I can find. There's also a dearth of information about the brand. Why, "Rock Hills Farms"? A clue to the name is found on the Lexington, Kentucky tourist site"visitlex.com": "As you enter Buffalo Trace you’ll notice the stone Rock Hill Mansion where Albert Blanton lived". In the absence of firm information I'll just let the whiskey do the talking. In the end that's all that matters anyway. I believe the reports about the high rye mashbill #2. The high rye mashbill really shows in the nose and on the tongue. Color: in the glass: new copper penny orange-red. You can see it in the bottle too. A lovely reddish bronze. Rock Hill Farms bourbon is a lovely copper red color. Nose: August and lean. Acetone, honey, bitter orange and tropical fruits, herbal spice (cardamom? ), pipe tobacco, plus a musty meaty note - black forest ham. The nose is nuanced and opens over time, gaining depth, sweetness, and additional notes. Entry is off dry with both corn and rye sugars gently showing at the end of the entry, which is quite reserved. The texture is silky with a full mouth feel. The midpalate expansion is rich with peppery herbal rye, honeyed sugar maple, sandalwood, black pepper, and plant sap. This is a big flavor. There's a tropical fruit aspect in this midpalate sugar and rye-spice medley. I've seen it called "papaya". It think it is more of a pineapple upside down cake with some banana and tobacco mixed in. Sure enough, smokey savory notes join the black pepper and a cognac-like rancio in the turn to the finish. Elegant, complex, and filigreed at the end. There is oak, char, and sandalwood incense in the finish which is long and drying (but not unpleasantly so). There are wood tannins which show up more as a feeling than a flavor. Cool label is a plastic sticker. There is a big round corn whiskey sweetness perfectly wedded to the heat, zing, and herbal notes of rye. Unlike Wild Turkey's high rye mashbill offerings (which I love) which are more fruity and full, Rock Hill Farms is more lean and dry - an elegant balance that comes off as just right. Hot and yet full of corn and rye sweetness; clean and yet wooded with all the little details of the flavors of the oak clearly delineated. This is a complex and rich flavor profile that likes a lot of air time to open up. I found the flavor required a full half an hour of airing in a Glencairn glass before it fully bloomed. This is a strong assertive whiskey. For folks who love the richness of the bourbon flavor profile this will be treasured dram. Folks who find bourbon a bit hot and strident will find this a bit much. I'm definitely in the former camp. This is in my top 10 regular issue bourbons. 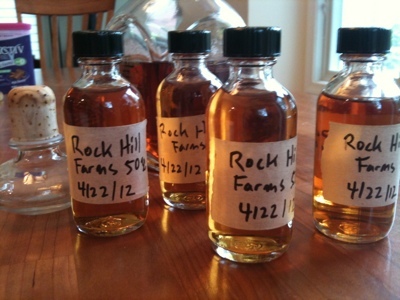 Value notes: Rock Hill Farms is $44.99 at Shopper's Vineyard at the time of writing. I've seen it as low as $38 down South. It's 65 pounds in the UK. This puts it at the higher end of the price scale for bourbons (For example 4 Roses Single Barrel is $32 at Shopper's Vineyard). I'll state right now that this particular refined flavor profile is worth it in my book. It has tough competition from the aforementioned Four Roses Single Barrel, as well as other fine bourbons in this price range such as Wild Turkey Kentucky Spirit, Eagle Rare 17, Elijah Craig 18, and others. However I find that Rock Hill Farms brings something different and valid to the table in its clean, elegant, semi-dry rye forward balance. It stands its ground well at this price point in my opinion. Carrying on the Value Whisky Reviews Open Bottle Shelf Life experiment. Ryan of Value Whisky Reviews / Value Bourbon Reviews started a fascinating series of experiments on the effects of oxidation and evaporation on whiskey left in open bottles. Follow the link above to read his 3 posts on the topic. The experimental methodology is to fill samples when the bottle is first opened and then compare them with the bottle over time as its contents oxidize. I'll be performing these experiments on an ongoing basis. Thus, when I opened this bottle I filled 5 two oz. sample bottles and will compare them with the remains of the bottle over time. I'll be looking at mouth feel, aromatics, nose, and flavor and will use Ryan's five point scale of discernible affects. I'll try to do comparison tastings at 3 months, 6 months, 9 months, and a year. However, I must tell you right now that this bottle of Rock Hill Farms is never going to last a year. At the current rate of consumption it will be lucky to last a week. Hi Ryan - thanks for commenting. I have tried Blantons. Blantons was one of the first single barrel premium bourbons, so we owe it a debt of gratitude as a founder of the new high end. That said, I'm not tremendously in love with it. I agree with your tasting assessment. Rock Hill Farms may share the same mash bill but it's a much richer mouth feel and fuller flavor profile. Rock Hill Farms is hard to find. I know of only 3 liquor stores in my area that carry it (Astor Place, Park Ave, and Shopper's Vineyard). It's worth seeking out, however. It's almost majestic. I believe Blanton's uses the same high rye mashbill as Rock Hill Farms. The taste differences between the two suggests there is a difference in where the barrels are aged. 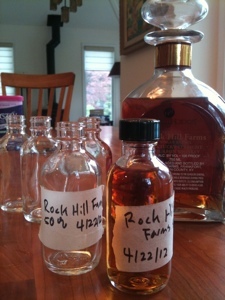 By the way Rock Hill Farms is the name of Albert Blanton's home near Buffalo Trace so you're correct there. Hi! Thanks for corroboration on the name of the brand. Yes, apparently same mash bill - but different results. We see this kind of thing in many places. For example, Elijah Craig 18 is apparently the same mash bill as Evan Williams Black. The difference is barrel management, aging, and the selection of outstanding single barrels. 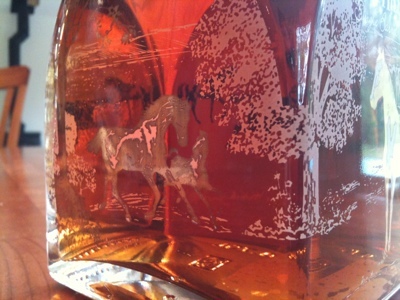 The difference is shocking, but apparently the master distillers of Kentucky know what they're doing. Elijah Craig 18 was also distilled in a different location. At this time, Elijah Craig 18 are the remaining stocks from the old Heaven Hill distillery that burned down in 1996 (the barreling dates predate the fire). Every other Heaven Hill brand appear to have been made after the company moved to the Bernheim distillery. It would interesting to do a taste comparison in the future. The Bernheim Distillery was heavily redesigned by Heaven Hill to suit their production style (under United Distillers Bernheim was heavily automated; Heaven Hill took out much of that). Incidentally, Heaven Hill had to outsource production to Brown-Forman and Jim Beam (it's always heartwarming to read about neighbors coming to help after a catastrophe) from about 1996 to 1999 while the company purchased and redesigned Bernheim so there might be a few barrels of Elijah Craig 18 made from those locations. Thanks so much about these details of EC18's provenance. Who ARE you? Is this Josh? Sku? Tim? You know a LOT about bourbon. I really should get a user name set up. I post now and then as Shuboy on the StraightBourbon forums. I've been really fascinated by whisk(e)y in the last few years and I've been reading up A LOT on the subject. Maybe a little too much. It's actually amazing how much info can be found online these days. Most of the info on Heaven Hill I found on ellenjaye.com (thanks Ellen Jaye whoever you are). Her historical summaries and distillery visits are amazing. My thoughts on EC18 are more of an interpretation based on the historical record. In fact from the dates I've noted I wonder where Elijah Craig 12 is being made now? Well Shuboy, I really appreciate you coming by and shedding light on this topic. And thanks for providing your source. I'll definitely check out ellenjaye.com. What a great referral. I'm planning to do a flight of Evan Williams and the EC expressions. I'll try to get in touch with Heaven Hill and ask them to clarify. Who knows, maybe they will give a straight answer? You're welcome. And I must need new glasses because the ellenjaye front page names the couple running the site: John and Linda Lipman (L&J). Their write-up on Four Roses is the ONLY source I've found online with a well researched history of the distillery. The most important point they discovered is that the Four Roses story provided by the distillery (and found on their website) is mostly marketing BS (which isn't uncommon in this industry). A recent thread on StraightBourbon asked why Buffalo Trace's Mashbill 2 isn't part of their Antique Collection and why the US has gotten a cask strength version of this bourbon (a cask strength Blanton's is available in Japan). What I was surprised to learn is that Mashbill 2 and the bourbon brands that use it are owned by a Japanese company known as Age International. Chuck Cowdery actually mentioned this fact before on the forums but it's amazing how this fact hasn't fully filtered out. Apparently the company purchased the mashbill and brands from Ancient Age but the distillery (later renamed Buffalo Trace) went to Sazerac. So the brands Ancient Age, Rock Hill Farms, Elmer T Lee, Blanton's, and Hancock President's Reserve are pretty much made at Buffalo Trace under contract to Age International. Which explains why Rock Hill Farms has no mention of Buffalo Trace on the label.